Mission scientists knew two things: they'd never seen anything like it elsewhere in our solar system, and they couldn't wait to get the story behind it. Over the past year, after analyzing the images and other data that New Horizons has sent back from its historic July 2015 flight through the Pluto system, the scientists think they've solved the mystery. 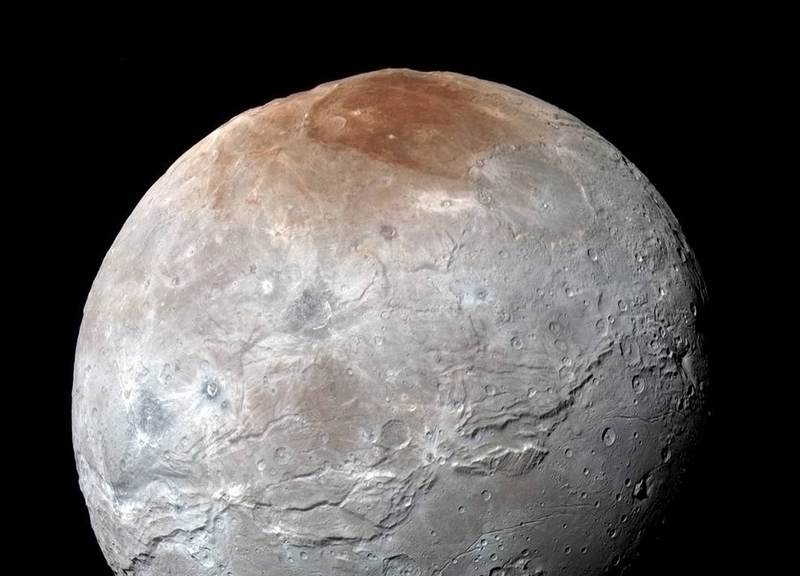 As they detail this week in the international scientific journal Nature, Charon's polar coloring comes from Pluto itself -- as methane gas that escapes from Pluto's atmosphere and becomes "trapped" by the moon's gravity and freezes to the cold, icy surface at Charon's pole. This is followed by chemical processing by ultraviolet light from the Sun that transforms the methane into heavier hydrocarbons and eventually into reddish organic materials called tholins. Sunlight further irradiates those leftovers into reddish material -- called tholins -- that has slowly accumulated on Charon's poles over millions of years. New Horizons' observations of Charon's other pole, currently in winter darkness -- and seen by New Horizons only by light reflecting from Pluto, or "Pluto-shine" -- confirmed that the same activity was occurring at both poles. Reference: "The Formation of Charon's Red Poles from Seasonally Cold-Trapped Volatiles," W. M. Grundy et al., 2016 Sept. 15, Nature [http://www.nature.com/nature/journal/vaop/ncurrent/full/nature19340.html]. The Johns Hopkins University Applied Physics Laboratory in Laurel, Maryland, designed, built, and operates the New Horizons spacecraft, and manages the mission for NASA's Science Mission Directorate. The Southwest Research Institute, based in San Antonio, leads the mission, the science team, payload operations and science planning. New Horizons is part of the New Frontiers Program managed by NASA's Marshall Space Flight Center in Huntsville, Alabama.